EIB Climate Survey: Are companies really helping us lower our carbon footprint? Ahead of the global climate conference COP24, which took place in Poland on 3-14 December 2018, the European Investment Bank launched a first-of-its-kind climate survey, in partnership with the global public opinion company YouGov, to find out how 25 000 citizens feel towards climate change in the European Union, the United States and China. Discover below some analysis and visualisations of the key findings from the fifth of six releases of this worldwide EIB climate survey. You can download the full results data set here. The survey results reveal that 54% of Europeans feel that products and services offered by businesses do not match their willingness to lower their carbon footprint, with Cypriots feeling the least supported at 81%, followed by Portuguese citizens (65%) and Italians and French citizens tied at 64%. Estonians feel the most supported by companies in their climate-friendly attitude with 35% of respondents feeling rather or very supported by companies. 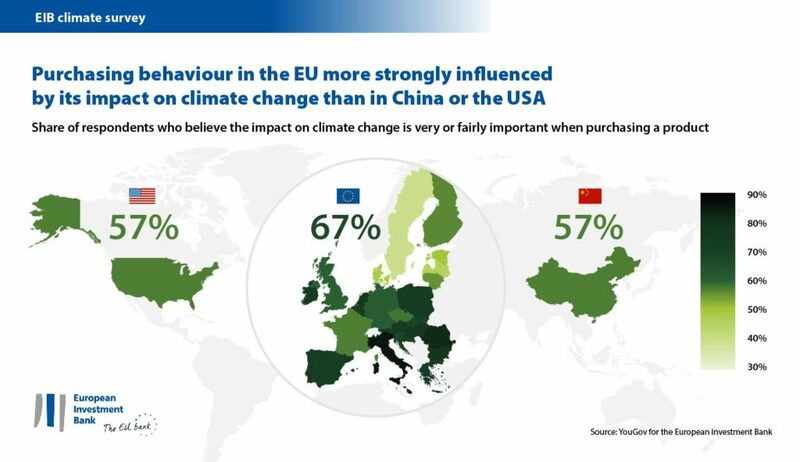 The survey also highlights a stronger concern from Europeans for the impact of a product on climate change than in China or the United States: 67% of Europeans state that the impact of a product on climate change is very or fairly important when carrying out purchases. This is 10% higher than for Chinese or US respondents.